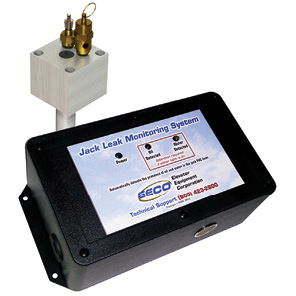 The Electronic Leak Monitoring System (ELMS) is designed as a discriminating device. That is, the monitor array is designed to report the presence of a liquid trapped between the jack cylinder and the sealed PVC liner and to determine whether the liquid is water or oil. A secondary test for verification of leakage can be made by applying a suction pump to the test line at the monitor control block. 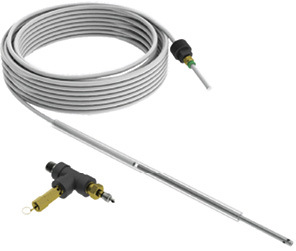 NOTE: This system can only be utilized on new jack installations, or jack unit replacements, with sealed PVC liners. The Evacuation System (EVS) is to be used to evacuate / inspect fluid leakage into the cavity between the cylinder and PVC liner of in-ground hydraulic jack system. The minimum required space between the largest outside diameter of the cylinder assembly and inside diameter of the PVC should be 1/2”.